Aline B. Frappier, daughter of Alterie and Eva (Joly) Frappier, was born in 1931 in Woonsocket, RI. 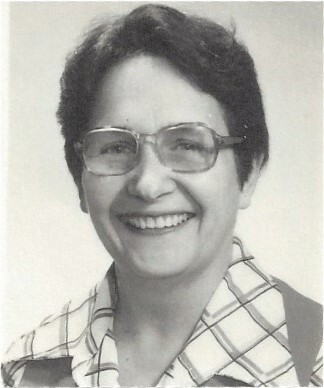 She attended Holy Family School and graduated from Saint Claire High School in 1949. She then attended The Wilson Junior College in Boston, MA graduating in 1951 with an Associate of Science Degree and certification as a laboratory and X-Ray technician. She then worked at Woonsocket Hospital and the Godard Hospital in Brockton, MA. Aline then returned to college in 1956 at Butler University, Indianapolis, Indiana graduating with a Bachelor’s Degree in Science in 1959. She then enrolled in the University of Maine at Orono, on a teaching fellowship, with a major in Analytical Chemistry and Math, graduating in 1961, with a Master of Science Degree. Aline then became the Science Department Head at Woonsocket High School, teaching Chemistry. In 1966, she became an Associate Professor of Chemistry at RI Junior College first at the Foundry Building in Providence, then the new campus in Warwick and finally at the new campus in Lincoln, the Flanagan Campus. She retired after 30 years of service in 1996. During her teaching years at RI Junior College, she co-authored 3 laboratory manuals. Aline was a lifelong communicant of Holy Family Parish in Woonsocket, serving as a Lector, Eucharist Minister and for many years, a Trustee of the Parish. She leaves one brother, the Rev. Msgr. George L. Frappier, several cousins and a very dear friend who lived with her for several decades, Constance M. Thibault. Her funeral will be held on Monday, (April 15th) at 9:00 AM from the Kubaska Funeral Home, 33 Harris Ave. Woonsocket with a Mass of Christian Burial at 10:30 AM at St. Joseph’s Church, 1200 Mendon Road, Woonsocket. Burial will be held in Resurrection Cemetery. Relatives and friends are invited. Visitation hours are Sunday, from 2:00 to 4:00 PM.